It almost feels like a lifetime ago when I was living my days on the NICU ward spending every moment possible with my first born. It was January 2013 when we discovered I was pregnant, making the decision to start a family was a daunting one, more on my part as I worried about how I would cope with pregnancy, the changes in my body and inevitably the labour but nothing prepared me for when my eldest son arrived 11 weeks early and completely shook my world to its core. Our little champion decided to arrive in the middle of the blistering summer that we had in July rather than the late September when he was due. It had all started a week before he was born when I was struck with very sudden and painful backache, I blamed the uncomfortable mattress at the in laws and cursed them for being made to be so uncomfortable when I was so whale like in my pregnancy. When the backache didn’t ease, I had fears of preterm labour so we got ourselves checked out on our way home from a weekend in Edinburgh. My worries were soon put at ease when all seemed to be fine, I was given a clean bill of health and I started to come to terms with the fact that I had just entered the third trimester and maybe this was my cumuppence for having what was a fairly easy pregnancy. Throughout the week that followed I continued to suffer the continuous backache. I didn’t put two and two together when I was having to walk around the house at 3 am as I couldn’t sleep because my back ached so much or have long hot showers to ease pain or when I sat down I felt like I was sat on something (his head!!! )….Nor did I twig when trying to go for a wee that I needed to lift my bump up as his head was so far down he had cut off my urethra!!! It wasn’t until exactly a week later from when the backache started I decided something just wasn’t right and I needed to get checked out. That day was sports day I remember it so clearly, I had been screaming my form on in each race that they were competing in, taking down the scores and seeing how far we were winning, I was slapping on the suncream in the blistering heat and looking forward to my first ice cream of many when I decided to nip for a quick wee (no such thing as quick when you’re the size of whale). I thought I was just being paranoid when I discovered a faint tinge of pink but I thought it was best to be annoying than leave anything to chance, so I made the call. I arrived at the hospital and was quickly checked out, I apologised profusely for being a pain and wasting time and then I remember the midwife doing the examination and looking up and saying rather nonchalently “I’m struggling to see properly I’m just going to get the Dr to come and have a look” little did I know that she had started to inform various people that I was showing signs of preterm labour. After the Dr did a quick ultrasound she informed me that I was already 2 cm dilated….I felt like I had been hit by a bus, I had worried that this could potentially happen but never did I think it would be a reality….my reality. I was quickly admitted and hooked up to goodness knows what to try and stop whatever was going on. Inside I knew I had to try and remain as calm as possible, I knew how important it was to keep it together but I also knew that this could end in my worst nightmare. I was injected various times and pumped with all sorts to help mature lungs, protect the brain in case of oxygen distress, slow labour….I felt like a human pin cushion. Then came the reality of the situation. 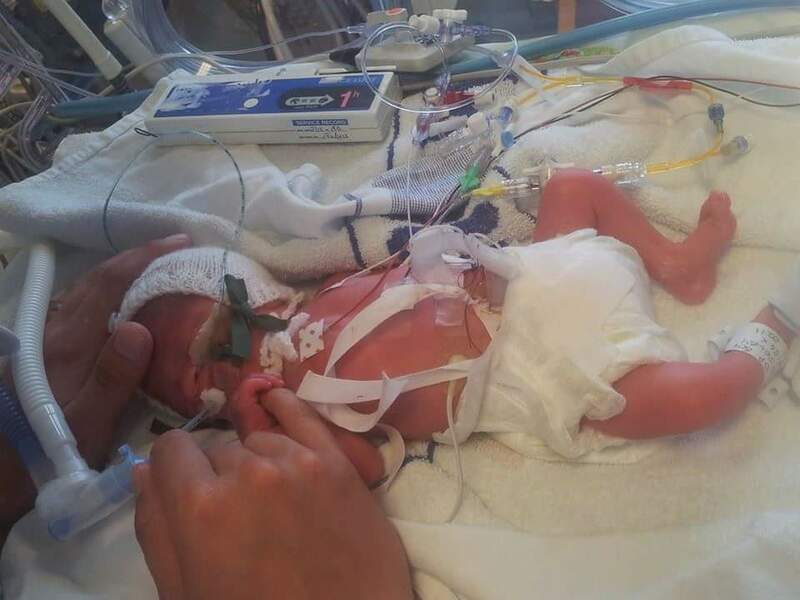 After speaking to the neonatal paediatrician we were told what the chances were and what to potentially expect, luckily the chance of survival was high at 90% but the chances of something being wrong were stacked against us. There was a 60-70% chance that our precious baby could potentially have respiratory issues, problems with eyesight, intestinal complications or mental and physical underdevelopment. So many times throughout that day I questioned everything I did…was it something I had done? What was wrong with my body? What would we do if something was wrong? How would I cope if the worst happened and our baby didn’t make it? I tried so hard to take my mind off what I knew was the inevitable, no amount of drugs was going to stop what had started, we were going to have a baby. Ten hours after I was admitted I was examined again, the drugs hadn’t worked I had progressed to 8cm, I guess the only humorous moment I have about the whole experience was the moment the contractions intensified so much that I was no longer moaning but I had advanced to mooing…yep I had transformed into bovine form and mooed. After a few hours of mooing our little bundle started to go into distress, the most painful moment in my whole entire life was about to occur. There was no time for pleasantries or for pain relief to kick in,the forceps were in and within seconds our baby was literally ripped out. I can only describe that moment as a true out of body experience where I looked down upon the room filled with people and hearing the blood curdling scream and seeing the demonic look in my eyes….that was a true exorcist moment. The moments that followed were so tense as we waited to hear something, a whimper, a gasp, anything. What we got was the faint cry from what sounded like a baby sea gull, it was the sweetest sound I could hear, at that moment our baby was alive. We didn’t have much of chance to see our tiny bundle as he was whisked off by the neonatal team. What was a room filled with people and buzzing with a hive of activity filled with concern soon became a isolated battle field. The room was quickly deserted and we were left alone having only caught a glimpse of our baby and finding out that we had had a son as he was wheeled away. The next few hours were torturous, we didn’t know what was going on, how he was, if he was OK. I literally felt like we were disconnected from the world as time stood still. Five hours after he was born we were finally able to see our baby properly for the first time. Nothing could have prepared me for what I saw, as we were ushered into the intensive care of NICU we edged our way to an incubator in the corner of the room, the sounds of various alarms and machines echoed around, inside the incubator was the tiniest body consisting of just skin and bone, there was not a squidge of fat on him, his skin was so baggy and he was just so tiny. The next 48 hours were the most heart wrenching as we watched numerous blood tests being done, various tubes being connected with medicines being pumped into his tiny body and hearing alarms going off left right and centre but our little fighter was proving his worth right from the start, all 2lb 15oz of him. The next few weeks were a roller coaster of emotions and achievements. There were days when we took one step forwards and others where we took two steps back. Seeing your baby turn purple in your arms as they momentarily desaturate will stay imprinted in your memory forever. But as the days passed our little munchkin got stronger and stronger and we were able to finally cuddle our little boy and hold him close and not have so many wires and tubes in the way. The day the nurses finally removed all of his wires was the scariest, I had lived the past 5 weeks reading his notes every morning monitoring his heart rate and oxygen levels, the soundtrack to my days were the machines that beeped and alarmed every few seconds, the moment it was all taken away I suddenly lost all confidence, what if I didn’t know if my sons heart rate was too fast or slow? What if he regressed and started having desats and apneas again? We were almost at the last hurdle and I wasn’t prepared for it, I’d lived his life so far with every inch of him monitored…..now we were ready to go at it alone. Our first night together alone in the hospital was spent with me holding him close and watching him all night, I didn’t want to put him down, I couldn’t be apart from him for a moment, he was my world and I needed to protect him every second of the day. How things have changed so much in the last 22 months, he is no longer the little bundle that came home 6 weeks after he was born. He is no longer the tiny person who could be picked up and held in one hand, instead we have our vibrant crazy monster who loves to get dirty, he is far from the fragile baby that could only have a hand gently placed on him as it hurt if he was touched too much, now I have a mini beast who clambers all over me like I’m his personal climbing frame. We’ve come such a long way and what we went through seems like a lifetime ago but the memory is forever tattooed in my mind. I hoped to never step foot in a NICU ward again….little did I know I would return 19 months later with baby boy number 2! PreviousQuarantined – we have the pox.